Home Gibraltar Operation Barbary Sun is go! Operation Barbary Sun is go! 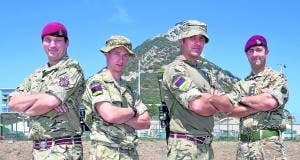 THERE are worse places than Gibraltar to find yourself posted on a two-week training exercise. This was the destination for over 100 troops from 16 Medical Regiment, who have been on the Rock taking part in ‘Exercise Barbary Sun’. The complex tunnel system provides a ‘unique training ground’ according to organisers… and presumably some respite from the sun! The medical teams rehearse real life medical situations through training in the field, dealing with a variety of casualties at the Field Hospital.